Man, it's a hot one. Like seven inches from the midday sun. Hope you’re staying cool! 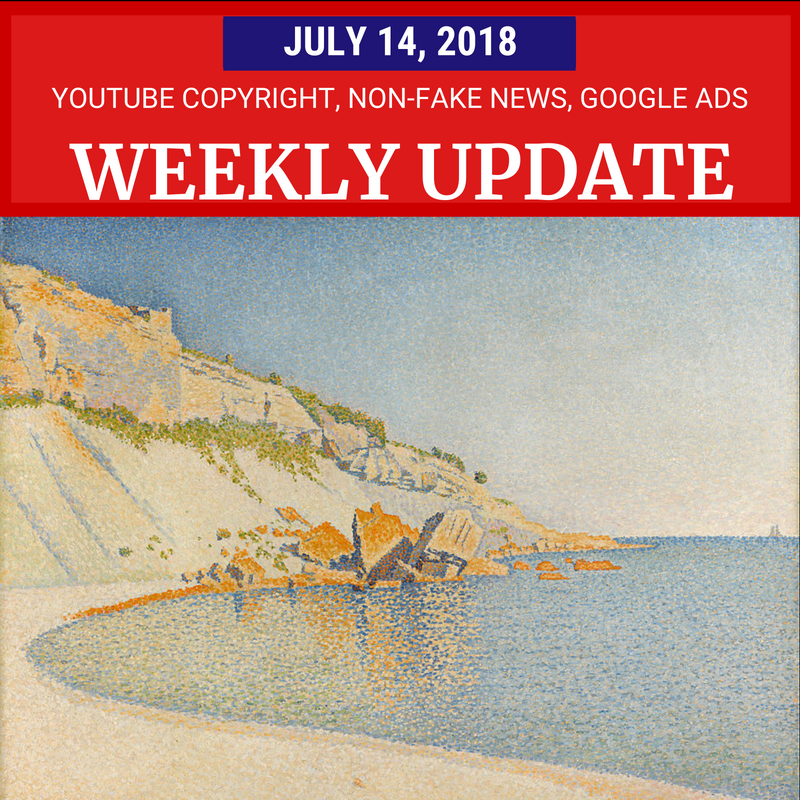 This week there’s copyright tools for creators, YouTube and Facebook initiatives to fight the spread of misinformation, announcements from Google Marketing Live 2018 and more. YouTube is trying to help creators protect their content. The new Copyright Match tool allows creators to find their videos that have been uploaded to other channels, and then contact the uploader or ask YouTube to take down the video. This isn’t quite the same as Content ID - it only finds full matches, not clips or audio alone, and there is no option to monetize the detected video. It’s currently rolling out to channels with at least 100,000 subscribers, and YouTube hopes to eventually provide this tool to all channels in the YouTube Partner Program. YouTube also now has a special troubleshooter for help with copyright issues. It’s definitely makes it easier to find the information you need rather than navigating through the help center. The official YouTube Creators channel is being consolidated with the YouTube Creator Academy channel. The YouTube Creator Academy channel will now be called YouTube Creators, and will have educational videos as well as inspirational stories. The YouTube Creator Academy itself isn’t changing. YouTube also has an official YouTube Help channel, with brief tutorial videos. News in the news. Made up news and conspiracy theories tend to get a lot more shares and views than measured and relatively slow reporting, especially when a news story is breaking. Social media sites have been trying to figure out how to stem the spread of false information, which is difficult when their algorithms are designed to promote content that is “engaging”. YouTube announced this week that it is working on a number of initiatives to improve the news experience. In addition to investing millions of dollars to support news organizations, they will start linking to (non-video) news articles related to breaking news stories in the YouTube search results to provide context. Plus they will highlight videos from news organizations. YouTube is also going to add links to third party sites such as Wikipedia and Encyclopedia Britannica on videos related to a “small number” of topics that are often subject to misinformation, such as the moon landing (which was not a hoax). It’s not clear whether this will help change anyone’s mind, and the fact that Wikipedia can be edited by anyone seems like it could be problematic. Facebook, also an efficient platform for the spread of misinformation , gave reporters a private screening of their 12-minute short film on fake news. During the question and answer session, Facebook stumbled when asked about what actions it plans to take on Pages like InfoWars that are labeled “news”, but spread conspiracy theories and misinformation. Their plan is apparently to make posts from such Pages less visible in news feeds. However, it’s been pointed out, that false theories that have a kernel of truth that are most insidious, and it seems like Facebook hasn’t really figured out how to stem the tide of misinformation without fully penalizing popular Pages. I’ll bet some of you are thinking “enough of this content business, what about the ads?” Last week was Google Marketing Live, Google’s annual advertising conference. You can watch Google’s keynote address, where they made a number of announcements including how machine learning is helping advertisers, new ad formats for YouTube, automated Smart Ads campaigns for small businesses, and that Hotel Ads will become a part of Google Ads (formerly AdWords). They also launched the ability to track users across devices in Google Analytics. See my article below for links and more tips and updates for video creators, Plussers, business owners, webmasters and more. 17 July: How G Suite customers can use the new Hangouts Meet hardware kit to set up affordable, reliable video conferencing at scale.